Are you tired of your old itchy, scratchy washcloths on your little one’s delicate skin? Please stop using and try YOOFOSS Baby Muslin Washcloths now! 1. 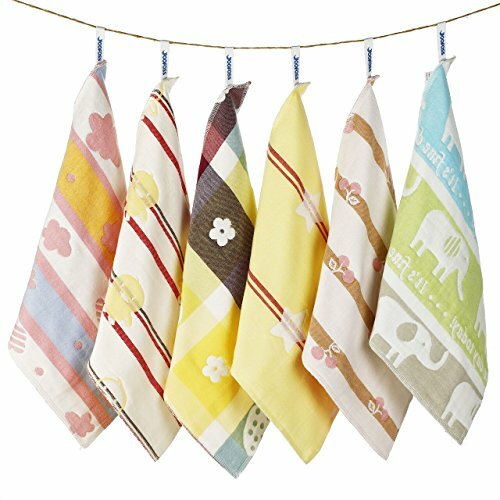 100% eco-friendly and soft material: our baby washcloth is made of 100% extra soft organic muslin cotton which has no formaldehyde and decolorizer. Very suitable for baby's tender skin. 2. 6 layer densely woven: unlike other washcloth in the market, our baby washcloth has 6 layer and is woven densely which can make the product longevity. 3. Superb edge sewing: the edge of our baby washcloth is sewed superbly. 4. Strong little loop: each baby washcloth has a little loop for you to hang easier. 5. Multi-use: can be used on both adult and baby face, baby body, such as baby wipes, baby face towel, baby body washcloth, baby bibs, burp cloth, feeding towel, makeup remover, etc. 6. Ideal gift choice for Baby Shower, baby registry, Thanksgiving Day, Christmas, New Year. ★1.Wash and clean it before use to remove the peck of small weave dust. ★2. Do not bleach including laundry detergent contained decolorize to give baby nature's delicate care. ★3. Washing temperature under 40°, recommend hand washing to get a long use. ★4. Hang to dry after washing. Avoid sun exposure and put it in a ventilation shade in case of microorganism breeding.